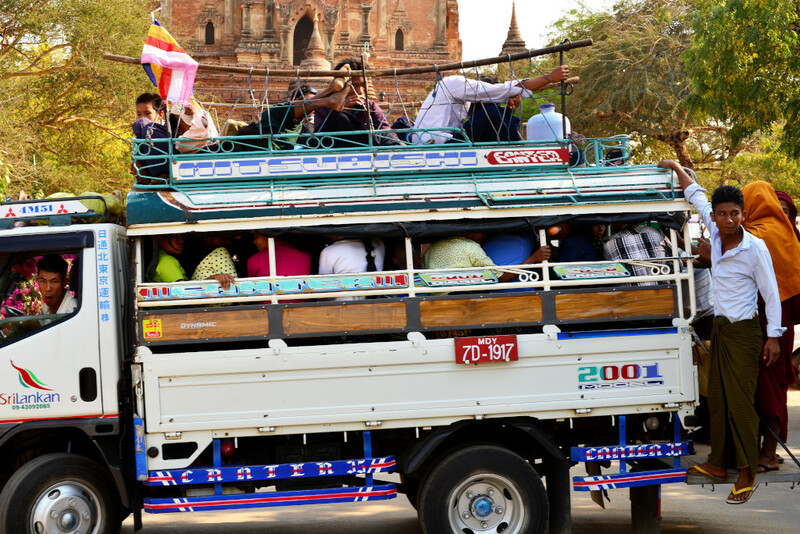 The day’s goal is to travel by bus to Bagan, which in effect means traveling to the town of Nyaung U, adjacent old Bagan, which is where most of the budget hotels are located. And to get to the town of Nyaung U, I have to pass through Monywa. Apparently a bus leaves for Monyway from the bus station at 9:15 am, so that means packing up and leaving early from Shwebo, the journey promising to take all day. Two quick Shan noodle soups at the Cafe Santino, an establishment that became sort of a hub of action here in Shwebo, although the places on the road to Kyaukmyaung would have done admirably also, had they been closer. Following a short pickup ride to the bus station, I am loaded summarily into an assigned seat in the express bus, the same as competing buses, but cleaner and impeccably intact. A bonus is the large windows, so that you are surrounded by glass and enjoy a stellar view of the surrounding countryside. The roughshod country road to Monywa is poorly paved, but highly atmospheric nonetheless. The countryside already appears bleached in the mid-morning light, the rice paddies fallow and waiting for the summer’s rains. 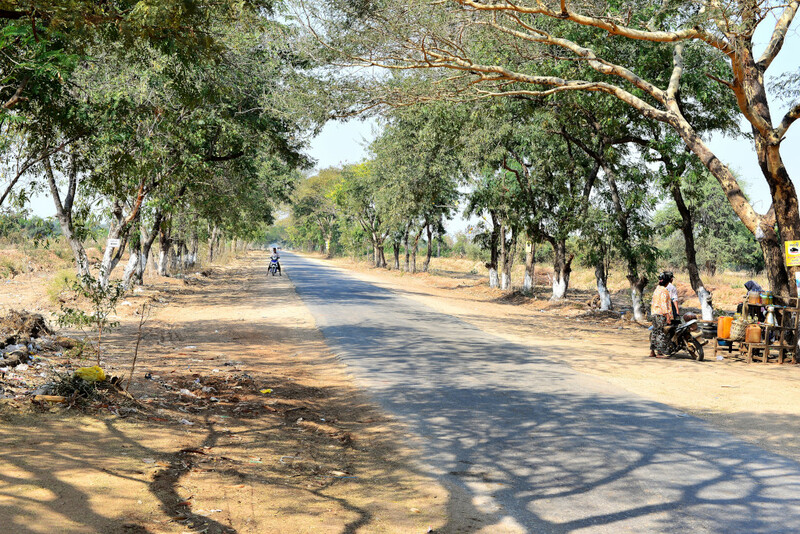 The entire road to Monywa is lined by low acacia trees that can sustain the dry climate and provide some shade to passers by. Most of the land is dedicated to rice plantations, but there is also a lot of thanaka which the Shwebo area is famous for, in addition to sugar cane, beans, sugar cane, papaya, even cotton. At a break in the middle of the largely rural area, a few small stands are set up by the road side, selling bananas and the intriguing Burmese salads made either of shredded papaya to which garlic, chili and lime are added, or a mix of what looks like sliced pickled beet, sliced green mango, and what smells and looks like a large-sized gooseberry. The bananas are amazingly sweet and juicy, redolent of strawberry. Monywa’s sprawl becomes apparent with street upon street of rambling residential buildings and small workshops, without any kind of apparent centricity or focus. Nor do the streets seem to be remotely adequate to contend with the amount of traffic passing through. We are slowed down considerably by the traffic, then finally arrive at the bus station, where the general jovial sweetness of the Burmese is in short supply in the country’s third-largest city, most of the faces business-like if not outright hardened. Even worse, a fight breaks out between two touts in the bus station. The road to the south is in better shape, our trip proceeding briskly through the somewhat roughshod rural landscape. 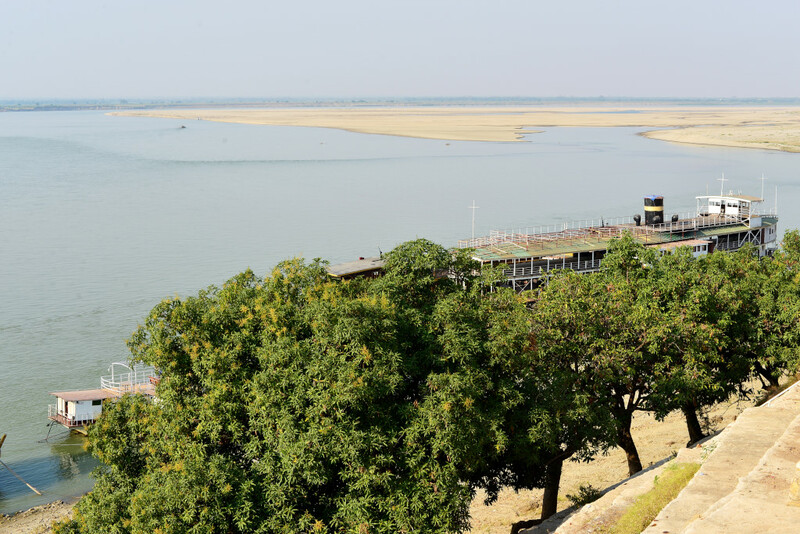 The trip to Bagan follows the general trajectory of the Chindwin river south to the Irrawaddy. 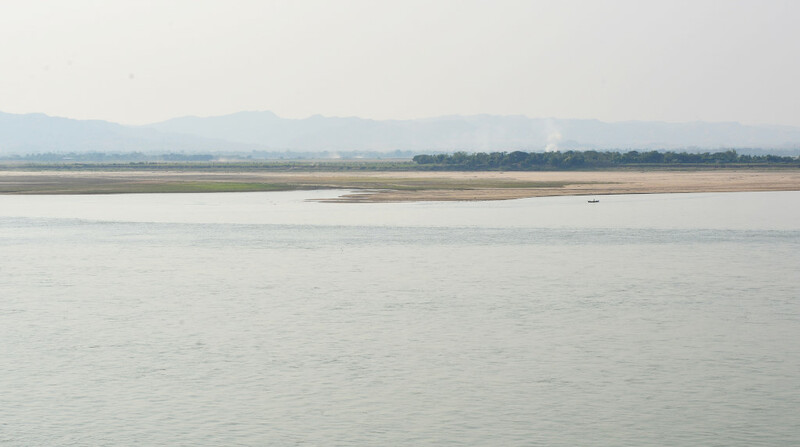 Towards the Irrawaddy, we encounter Pakokku, and the modern bridge leading across the river towards Bagan. The tarmac runs on both sides of the train line in the middle of the bridge. And following Pakokku, a mere 13 miles remain on the trip to Nyaung U. The landscape around us is broad but dramatic, the heart of the ancient Burmese kingdom. Large swaths of the river are now exposed dry sand flats, although in the rainy season the girth of the river must be vast. The region on the Bagan side of the river is far greener, more sugar palms in evidence, forest and more diverse agricultural crops, although I may be mistaken at the apparent verdancy of the land, given that it may also look greener in the falling light. The narrow gauge road continues towards Nyaung U with virtually no traffic, at least this late in the afternoon. We are actually quite lucky to have made it this far so quickly in the day, thanks to the good bus connections en route. Despite the fact that the roads were poorly asphalted and narrow, the buses were in reasonable shape and we managed to advance reasonably quickly. 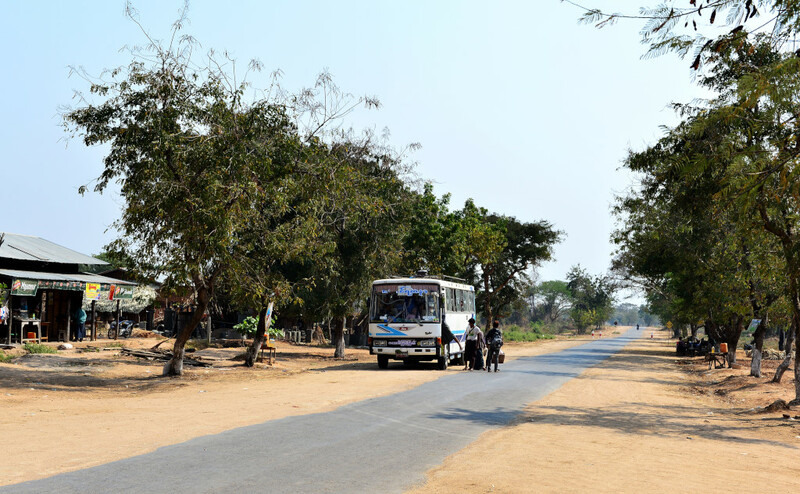 The Bagan bus station is brand new and virtually empty, but located inconveniently miles out of town. Being used to fleecing tourists, the taxi drivers at the station begin at some 10,000 kyat for the privilege of driving people into town. For better or worse, their brazen attempt at gouging only drives me to dig my heels in further, and decide I am going to embark on a hot and sweaty journey into town – on foot. That could have been a sound idea, but not carrying the mountain of gear that I have with me. Predictably, one taxi after the other stops by the roadside, progressively dropping the price to town as I keep walking further. However, I won’t budge – if they tried to cheat me at the outset, they’ll get none of my money, not even a penny! 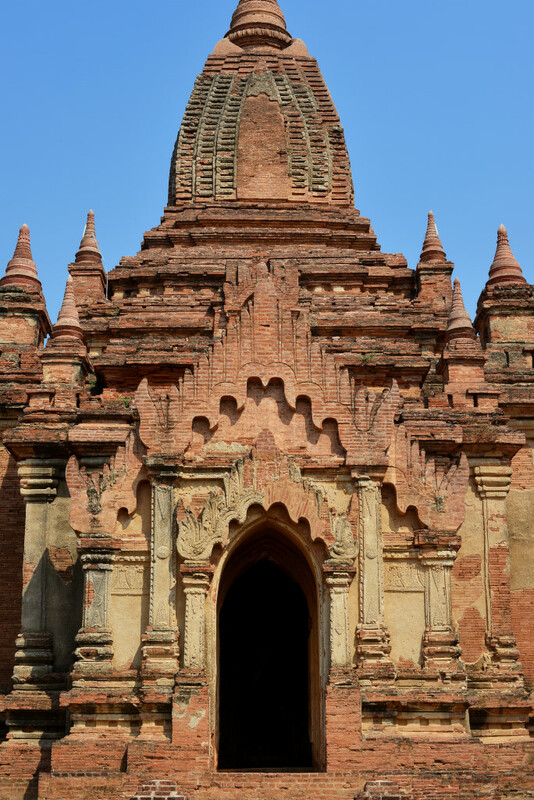 The Myanmar tourist authority collects a $20 entrance fee for the entrance to the Bagan archaeological site at a lone booth located by the side of the road. The long road leading to town is otherwise utterly empty. Rising further along in the scrub, a few mid-range guesthouses become evident, although my mind is set on a particular one the Lonely Planet recommends. I normally tend to be very skeptical of Lonely Planet accommodation recommendations, and my experience looking for a place in Nyaung U justifies that perspective. The town is supposed to be the hub for budget lodging and operations in the Bagan area, but I would hardly call any place here budget. As luck would have it, the best choice in town turns out to be virtually one of the first places I come across at the outset of the town, which features a somewhat untended but nonetheless ample property, with several structures, one with more basic and cheaper rooms, and second, three story building with spacious, quiet rooms with AC, TV, a small fridge, and large windows, very private, for not much more. Consistent with my neurotic obsession of finding absolutely the best deal, I won’t accept that this first establishment may be good enough, no, I have to keep searching, especially since I remain convinced that the place the Lonely Planet promotes may offer an even better deal, and be located further near the hub of this metropolis. What ensues is one of the truly regrettable chapters of traveling, where a little bit of planning and foresight could have saved hours of grief, stress and exhaustion. Having walked for miles into town with a heavy pack was a bad enough start. The town centre of Nyaung U may not be enormous, but the blocks are long, and trudging from hotel to the next an increasingly disheartening affair, the substandard, depressing rooms shockingly expensive for the inferior quality offered, rudimentary, characterless, small, stifling, and all close to being fully booked. Any rooms that look vaguely appealing, irrespective of the price, are fully booked. 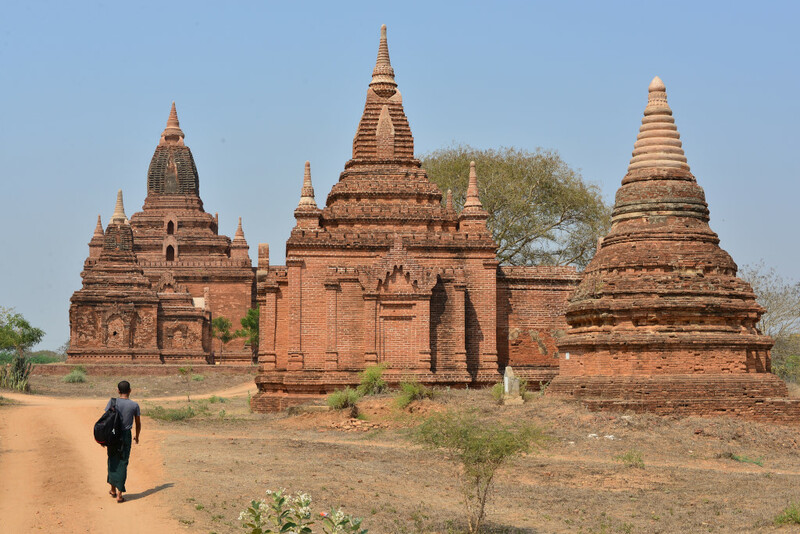 The walk around Nyaung U has driven home the reality of the incredible amount of tourism flooding into the country to see signature attractions such as Bagan. And the attitude greeting visitors here is a far cry from the gentle and kind reception that normally characterizes the country: haughty, arrogant, and dismissive, and why not, given that tourists are eating out of the hands of the hotel owners, what with the inordinately limited supply of accommodation. I traipse dispiritedly from one place to the next, choking back on my grief at the sight of some of the ludicrously expensive but run-down properties, without air conditioning, at best tiny windows, no wifi, barely enough room to stand, sagging beds, unkempt interiors, for $40 U.S. a night or more, which may not seem like a lot, but considering the average wages here are no more than a few dollars a day … The few rooms that may have been acceptable are gone by the time I return to the hotel in question. Dejected, I trudge back to the periphery of town where the hotel I originally visited upon arriving in town is located. It seems inexplicable to me that I even bothered looking any further than this establishment, given how spacious, clean, relaxed, and relatively affordable it is. All I need to do is haul my packs up the brightly lit cement staircase to the third floor of the new building, open the door to my room at the end of the haul, turn on the lights, throw the packs on the ground, turn on the A/C, close the door, and fling myself onto the bed. But the evening is not over. On my trek through town I discovered what few delights this village offers, from a few random tourist-friendly restaurants, offering upscale local and western food, for appropriate prices, and in comfortable, brightly-lit and clean settings, small, funky shacks selling artisanal products and tourist claptrap, and a few much more humble local restaurants. 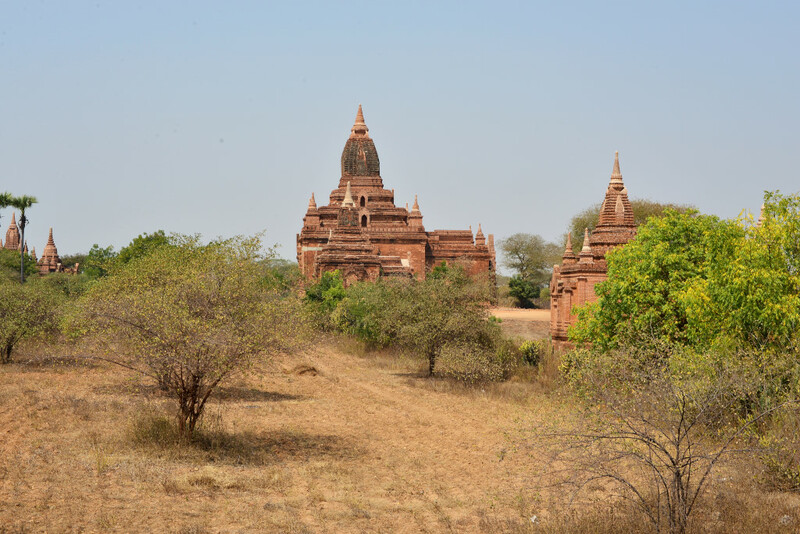 For the amount of tourist dollars flowing through Bagan, it is somewhat surprising that there aren’t more distractions oriented to westerners in town, but the absence thereof would only serve to suggest that the vast majority of tourists pass through, investing only the time necessary to be able to attest to the fact that they have visited Bagan. As a reward for the day’s travails, the elegant rooftop pizzeria whose pretentions at an elevated class go well beyond anything I would have imagined in Burma. Well, perhaps this only serves to contradict my earlier observation: a spacious, tiled terrace, whimsical lighting, European wait staff and romantic couples gazing longingly into each others’ eyes over candle light, lounge music playing, and from what I can see and later taste, very good pizza!